Founded in 1998, Zhejiang Lixin Instrument Manufacturing Co., Ltd. is a KWH meter manufacturer and supplier in China. 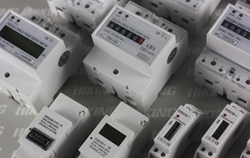 We have been providing "Hiking" brand electricity meters to our global clients for over a decade. Since we began, Lixin has been a market-oriented company which makes every effort in developing new KWH meters and providing better products and services. Located in Yueqing City, we have access to shipping methods of sea, land and air, so we are able to reduce the shipping cost for our clients. With ten years of experience in the research and production of energy meters, Lixin is now able to provide you with a wide range of KWH meters, including single/three phase KWH meters, single/three phase multi-rate KWH meters, single/three phase prepaid KWH meters, single/three phase multi-function KWH meters, single/three phase DIN-rail KWH meters, timer switches and more. Our KWH meters have gained worldwide popularity and are exported to South Africa, Greece, Netherlands, Malaysia, Philippines, Peru, Chile, Indonesia, Ecuador, Argentina, and Mexico, among others. KWH meters are a kind of electrical instrument generally utilized to test electricity consumption. Our KWH meters are designed with a variety of specifications and functions, and are able to offer more reasonable metering solutions in both domestic and industrial uses. Lixin KWH meters are made with high-precision molds. In addition, each component of our watt-hour meters is strictly inspected to ensure quality and reliability. With internationally-adopted production techniques, we can ensure reliable performance of our KWH meters. Lixin KWH meters have received the ISO9001 and CE certificates. They have also passed the IEC tests, with test reports of IEC62052-11, IEC62053-21. At Lixin, we have our own production workshop, where our experienced staff uses advanced manufacturing techniques to create our energy meters. With 11 years of experience in producing KWH meters, we can effectively control our manufacturing costs. In addition, our convenient location enables us to ship at a low cost to our customers. Therefore, we can provide high-performance KWH meters at lower prices. Lixin takes our after-sale services very seriously. We offer free wearing parts, to keep your production continuing smoothly. In addition, Lixin also offers an 18-month warranty for free maintenance and replacement.